"The Master Ultra Thin Minute Repeater Flying Tourbillon grande complication watch stems from research on two iconic horological complications. 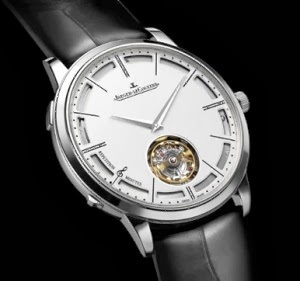 It is indeed the slimmest minute repeater in its category at just 7.9 mm thick." 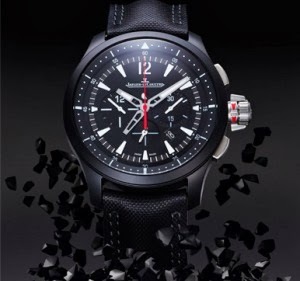 "The Master Compressor Chronograph Ceramic sports watch with its 46-millimetre diameter immediately proclaims its vocation as a precision instrument for sports enthusiasts who engage in feats across several continents. The indications stand out clearly against the semi-matt black dial, ensuring the perfectly readability of each item of information. Two openworked luminescent hour and minute hands point to the markers arranged around the dial. They are accompanied by a bold red chronograph seconds hand, whereas the filigree-style second time-zone hand appears to stay deliberately in the background while maintaining perfect readability in order to ensure graphic respect for the strictly hierarchical order of information. To meet travellers’ requirements, the GMT function inspired by the Home Time/Travel Time concept developed by the Swiss Manufacture is complemented by the indispensable day/night indication that appears through a window just above the Jaeger-LeCoultre signature." "Decidedly classic yet resolutely contemporary, the Rendez-Vous Date watch conceals an exceptional watchmaking heart beneath its slender frame. Clad in glowing pink gold, the 27.5 mm-diameter case – a new size for the collection – protects the Jaeger-LeCoultre Calibre 966, one of the smallest manually-wound movements on the watchmaking scene. Admirably epitomising the in-house expertise in the field of mechanical miniaturisation, it echoes the 101 and Duoplan movements that have made their mark on watchmaking history." "The manually-wound Jaeger-LeCoultre Calibre 849 is a marvel of finesse entirely crafted, assembled and decorated by hand in the complications workshop of the Manufacture. It comprises 123 parts, has a 35-hour power reserve and is equipped with a balance that steadily beats at a frequency of 21,600 vibrations per hour. 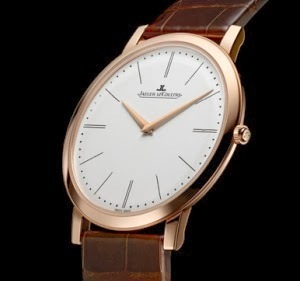 In keeping with grand watchmaking traditions, it also displays the hours and minutes via central hands with the legendary precision of Jaeger-LeCoultre movements, despite measuring a mere 1.85 mm thick." "The watch, equipped with a flying tourbillon and a perpetual calendar, has been created in complete respect for the noblest watchmaking traditions and is in tune with the quest for absolute precision treasured by the founder of the Manufacture Jaeger-LeCoultre. Within a large 42 mm pink gold case, the Jaeger-LeCoultre Calibre 985 beats to the rhythm of a flying tourbillon and is equipped with a cylindrical balance-spring, forming an ensemble that delivers exceptional precision-timing performance. 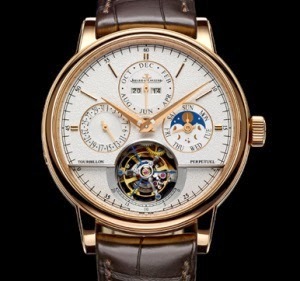 The tourbillon is a major feat in itself. Its grade 5 titanium carriage, its large 14-carat gold balance and its cylindrical balance-spring developed by Jaeger-LeCoultre create an impression of levitation: the tourbillon appears to be suspended in mid-air at the heart of the movement. The perpetual calendar provides a crystal-clear display of the day, date, month and year, along with the moon phases; while the daring small seconds counts off precious moments above the flying tourbillon." 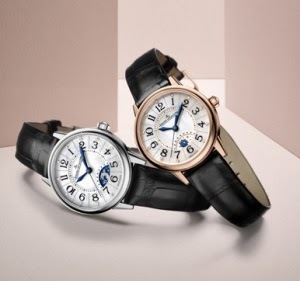 "The Duomètre Unique Travel Time Swiss watch is the first world-time watch enabling to-the-minute adjustment of the second time zone. This enables travellers to accurately set the second time zone on all continents and countries regardless of the time difference. Given the complexity of the functions, the finely grained dial provides impeccable clarity. Two magnificent symmetrically arranged subdials lend a perfectly balanced touch to this luxury watch: the first subdial at 2 o’clock sets the stage for the hour and minute hand; while the second at 10 o’clock hosts the jumping hour and minutes of the second time zone. The globe at 6 o’clock displays a world map surrounded by the time-zone indications and the day/night ring. The globe is synchronised with the travel time zone. The single crown is used to adjust the local time in position 2 and the travel time in position 1, as well as to wind the mainsprings when in position 0. 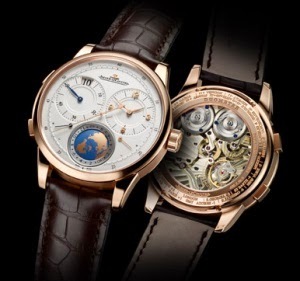 Once both time zones are synchronised, the traveller can simply use the push-pieces at 8 and 10 o’clock to adjust the jumping hours in the left subdial according to the destination country. And in case of a non-standard time zone, the minutes can be adjusted separately using the crown in position 1." 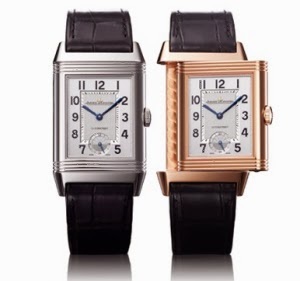 "The Grande Reverso Night & Day watch is powered by the automatic winding Manufacture Calibre 967/B. Like all movements developed and built within the workshops of the Grande Maison in the Vallée de Joux, it features outstanding sturdiness and reliability. Its balance oscillates at a rate of 28,800 vibrations per hour. It comprises 200 parts and provides a comfortable 42-hour power reserve, thus enabling its wearer to savour the carefree pleasure of strapping on a Swiss watch in the morning that has maintained an accurate display of the time while its owner enjoyed a good night’s sleep. Not to mention the assurance that the wearer's forearm movements during his normal daytime activities will be enough to give the mechanism of the Reverso the energy required for its noble timekeeping mission."